History has seen its fair share of brilliant, or even just lucky, military tacticians. These men not only knew how to do well in battle, but knew how to change the world. Each of them has quite literally changed history or even shaped the world as we know it today. Genghis Khan was the founder of the most enduring and powerful empire in history. He was the first leader of the Mongols and its lasting figurehead. His military genius and seemingly fearless leadership united the battling factions of northeast Asia and laid the foundations for the spread of his empire even farther after his death. He planned and executed invasion after invasion, turning much of Asia, the Middle East and some of Europe into the Mongolian Empire. Genghis Khan also may have fathered his own army. 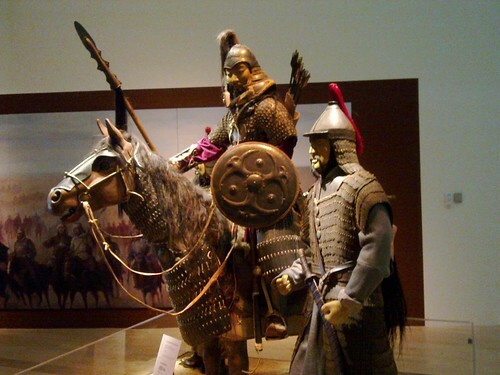 A group of geneticists believes that roughly 16 million people of today are descendants of Genghis Khan. Alexander the Great did not come across this sobriquet by accident. A student of Aristotle and a headstrong ruler, Alexander III of Macedon was one of the best generals in history. He became King of Macedonia in 336 BCE. Like Genghis Khan, he quickly began a relentless series of invasions, including one against Persia. He defeated Darius III, claiming the Persian Empire as his own, which is a noteworthy feat in and of itself, as Persia was yet another of the greatest empires of all time. He amassed an empire that spread from the Adriatic to the Indian subcontinent all by the time he was 30 years old. Hannibal Barca is the man famous for leading an army with elephants over the Alps into Italy. However, this is not his only major success. His enemy was Rome, and this Carthaginian made a massive invasion of Italy to take on his enemy. He went right through the center and straight to the tip of its boot. Unlike the other men on this list, he was no king or emperor. He was a leader of soldiers, not countries, but he was one of the best, even though the Second Punic War was lost to Rome. Julius Caesar was a ruler of Rome and one of the men who helped turn it into the Roman Empire. Contrary to popular belief, he was not an emperor of Rome. Once he was elected governor, he set to work expanding Roman holdings. Later, he rather impressively defeated Pompey in a civil war for Rome. It was then that he became ruler of Rome, but still not emperor. His reign was ended in one of the most dramatic assassinations in history. He was stabbed 23 times by senators in the Theater of Pompey. King Leonidas I was the legendary leader of Sparta who planned the Spartan stand at the Battle of Thermopylae. His brilliant tactics led to a very small army putting up a fight against a very big army. There were roughly 7 times more Persians than Greeks at the battle. Those few Greeks included Leonidas and an elite Spartan group of 300 men. Amazingly, they held their own for roughly a week thanks to the King’s strategy of holding them within a narrow, almost unavoidable pass. However, they were betrayed by Ephialtes, who led the Persians behind the Greeks in the pass. Leonidas sent most of the force home before they could be slaughtered, but the Spartans could not leave. They considered it their duty to never retreat or surrender. Thus, after killing untold thousands of Persians, Leonidas and his 300 were killed at the Battle of Thermopylae. Carl Henson is a military historian and guest author at Military Education, a site with guides and reviews of top-rated military friendly degree programs. Click here to see the greatest military upsets of all time. Leonidas I? Are you being serious?! He’s no way among the greatest tactician. Holding a large army with a small army with the help of the terrain isn’t new, he didn’t even invent it. Miltiades used this in the battle of marathon, which was a greater tactical feat. Genghis Khan is much more of a strategist than tactician, it was his subordinates who fought his battles. Where’s Sun Tzu, the creator of the “art of war”, Saladin or Napoleon Bonaparte?